I can be skeptical and cynical when it comes to faith. I think a lot of what gets talked about in Church is superficial and disconnected from real life. I have big questions that nag at me: How does prayer really work? How do we depend on God while still being real humans in the real world? How do we make sense of all of the weird stuff in the Bible and be faithful as we follow Jesus in an increasingly complex and confusing world? And because of who I am, I pursue these questions intellectually. I want a helpful way of viewing God, life, the Bible, community, etc. I like to have answers. I like to be able to explain things. And pursuing these questions is a huge part of my faith. The problem is, sometimes the answers become the end rather than the means. Sometimes I can feel very self-satisfied because I have what I think is a good way of explaining the world and God. I can feel I have a good intellectual handle on life. Sometimes, this means I am more dependent on my idea of God, rather than God. But then I have rough weeks. And when I have rough weeks I become much more aware of my own limitations. The older my kids get, the less I seem to know how to parent and handle all of the things that are involved in raising children. I was an expert parent when my wife was pregnant for the first time. Now I find that I know less and less and there are no books written on how to parent my own unique, beautiful little humans. The deeper I get into my Ph.D. program and the closer I approach an “expertise” in “my” area, the more I am aware of how little “expertise” I really have. Academic knowledge is inexhaustible, and even focusing in on one area is daunting. And the more I pursue my dissertation topic, the more I realize this topic is not mine at all. It is a gift, something I am observing and allowing to shape me, and then I will turn around and give it away. I don’t know how prayer works, and I am cynical about church. But when I hit moments where I have no control and can do nothing but wait, prayer is a very real and powerful thing. When I have moments where people prayer over and for me, I could care less about the state of institutional church, I am experiencing love and prayer in community in tangible ways. When I have rough weeks my intellectual pursuits of God mean a lot less. And the Beatitudes mean a lot more. When I mourn and am meek, I experience God much more than when things are going my way. Because when we are at the end of ourselves, we need to know there is something bigger than our own strength and power. And we want to know that whatever it is that is bigger than us is good and on our side. When things go my way, when I have the power to control my circumstances, when my own talents and abilities are helping me climb the ladder (which is the opposite of what it means to be “meek.”), I can often mistake those things as God. In fact, I often rely on God less and less when I have power and control. I do just fine on my own. And I just assume God is in whatever I am doing because it is all working out. And isn’t happiness, pleasure, power, and wealth what God really wants for me? The Beatitudes don’t make sense to us very often because we are usually winning at the game of life. But when we find ourselves at the end of our rope – where our own talents and ability to control our world are no longer sufficient for the demands of real life – the Beatitudes are a beautiful encouragement. The help us make sense of it all. They point us right to the God who is big enough and good enough to get us through whatever it is that weighs us down. At the end of the rope is God. When we reach the end of ourselves, we find God in deeper and richer ways. We recognize our limits and as we do, we see God more clearly. In these moments, God doesn’t give answers. God gives God’s presence. And that is enough. God is comfort. God is peace in the middle of chaos. God is bigger. God is good. Our situation may not change. It may even get worse. We may hurt and suffer. But God is present and moving. We feel God as we pray. We feel God as others pray for us. We feel God in the hugs and phone calls from those who hurt with us. If we don’t allow ourselves to find God at the end of the rope, life seems pretty bleak. I don’t have what it takes, I can’t make much of a difference. And the difficult situations overwhelm and begin to break us down. There is no where else to go except more despair and hopelessness. All that is left is the difficulty and my powerlessness to change it. But when we find God at the end of the rope, difficulty looks so much different. 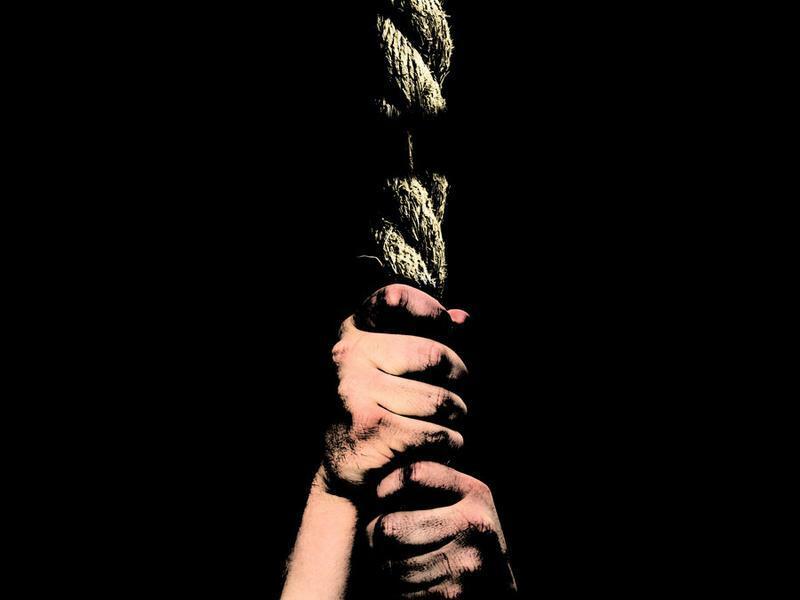 If the only thing at the end of my rope is me, my difficulty has all the power. It paralyzes me and defines me. But if at the end of my rope is God, I have the hope of moving forward. We acknowledge our hurt, sit with it, and it even has a role to play. But we don’t give it power. We don’t let it paralyze us. I am comforted in my mourning and am confident in my meekness because I no longer I have to be the center of the universe. There is something bigger than me not only moving me forward, but who loves and cares about even my tiniest of hurts. When we are in control of our lives, the Beatitudes don’t make a lot of sense. But down here at the end of the rope, they are a great source of peace and comfort. They are a reminder to keep going, because THIS is where we find God. This entry was posted in Uncategorized and tagged Beatitudes, Comfort, Hope, meek, Mourning, Peace, Presence, Suffering, The Beatitudes. Bookmark the permalink. I thought this was so rich … thank you for sharing these thoughts. I really appreciate that John! Thanks for reading!